Marble, the epitome of luxury, requires special care to stay in top shape. Protect your investment with these techniques. There’s nothing more elegant than marble, a timeless material available in a variety of colors and veining styles that makes fabulous flooring. This delicate, porous stone is notorious, however, for its susceptibility to stains—and only certain cleaning agents can be used on it without causing damage. How’s a homeowner to keep them looking brand new? 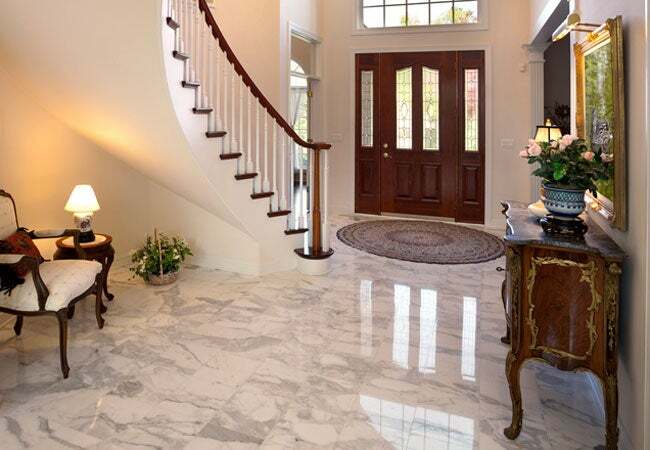 If you’re curious about how to clean marble floors in your own home, keep reading for all the tips you’ll need, from routine care to stain removal. • Stay away from harsh cleaners. As a calcareous stone, marble is highly sensitive to anything acidic. Just as cutting lemons directly on a marble counter is a recipe for disaster, using acidic cleansers such as those containing vinegar on marble floors will create dull spots called etching. Abrasive cleaning agents like scouring powders or creams, dry or soft cleansers, and bathroom, grout, and tub and tile cleaners should be avoided as well. Even a cleaner formulated for granite will be too harsh; granite is a siliceous stone that can handle acidic agents. • Beware of vacuums, which may scratch the stone surface. • Similarly, forego scrubbing brushes in favor of soft cloths to stave off scratches. • Always test in a small, inconspicuous area before using any of the methods for how to clean marble floors recommended below. • Clean marble floors frequently—especially when the presence of dirt and grit is apparent—with a clean, non-treated dust mop. A good rule of thumb to determine frequency is to dust mop once weekly per person or pet living in the home. So in a household of two people, dust mop twice per week. • Place non-slip mats and rugs around entrances to make your job easier. These floor coverings will help limit the amount of abrasive dirt that’s being tracked into your home from outside and damaging marble floors. Periodic cleaning, at least monthly but more depending on traffic or the presence of dirt, is a must for marble floors. Use a soapless cleaner with a neutral pH (pH7) if possible, which will minimize streaks or film left behind. You can also use a mild, phosphate-free dishwashing detergent or stone soap specifically formulated for marble. To clean, first wet the stone’s surface with clean water—you can use a spray bottle or wrung-out mop to avoid soaking the floor. Then apply the cleaning solution according to the manufacturer’s instructions with a soft mop. Thoroughly rinse the surface afterward with clean water—making sure to change out the water with fresh as needed—and dry the surface with a soft cloth. 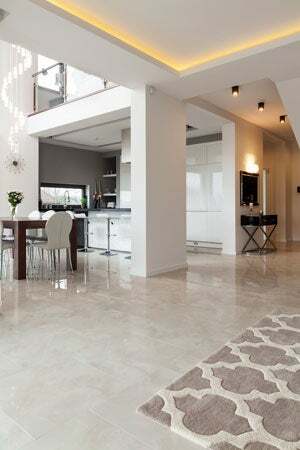 Drying the marble floors is an important step after every cleaning or spot treatment, according to the Marble Institute of America. Some marble contains iron oxide, and water may bring it up to the surface and leave behind rust stains. Treat stains as soon as you notice them—the longer you wait, the harder it may be to remove them. If something spills on the floor, blot it up immediately with a soft cloth, taking care not to spread the stain by wiping or smearing it. Flush the spot with water and mild soap, then rinse with more water. Repeat as needed and dry. If a stain escapes your notice at first, a more targeted treatment approach may be needed, because different stains require different treatments. Organic material (such as most foods, coffee, tea, and fruit)—perhaps the most common culprit on light-colored marble—can be banished with 12 percent hydrogen peroxide and a few drops of ammonia. (Note: While it’s safe to mix hydrogen peroxide with ammonia, do not mix in any other cleaners as they can cause a toxic chemical reaction.) Pour enough of the solution to cover the stain and give the solution between 10 and 30 minutes of dwell time, then flush with water. If you’re left with etch marks, wet the surface and apply marble polishing powder. Buff it onto the stone with a damp cloth and dry. For scuffs, the Marble Institute of America recommends an age-old trick: Rub a tennis ball around the mark. The soft material will safely lift the scuff out.